Signature ingredient: Certified organic peppermint stimulates the senses and invigorates circulation in the scalp. Certified organic babassu oil -- extracted from the fruit of the babassu tree -- is an excellent emollient with skin moisturizing properties that help to restore the hair's natural elasticity, making it soft, strong and silky. Product description: This conditioner revitalizes as peppermint invigorates scalp circulation and babassu oil restores elasticity and strength. Features and benefits: Designed to give your hair and scalp the optimum benefits of natural botanicals, this conditioner contains our certified organic herbal blend and certified organic peppermint oil, rich plant moisturizers and emollients, skin and hair conditioners like babassu oil and chamomile, and our science-based formulation of hair-enhancing vitamins and amino acids. Directions for use: Massage into clean hair from the roots up. Leave on as long as desired to absorb the enriching benefits of babassu oil. Rinse. For best results, use after shampooing with Peppermint Revitalizing Shampoo. Smells great but definitely doesn't condition my hair whatsoever. After trying it for two weeks, I've almost run out of product as I've tried increasing amount to get any moisture and it still failed. I am not as big of a fan of the conditioner as I am of the shampoo. I have long hair, but normally can get away with about a loonie size glob. with this conditioner I Have to use the size of a golf ball just to get it all through my hair. love the scent and the results but I have to use way too much product. I've long thin hair and use conditioner primarily to keep my split ends tame. The product only goes on mid length before I comb it down so I can't comment on how my temperamental scalp reacts to the conditioner, but I will say it's a job well done for keeping my hair angst-free. I don't end up using too much product per shower though I seem to be using more of it than I did of a previous brand I used. In any case, I'll stick with this conditioner, the scent is great and so far so good on the sensitivity-front, no reactions to report. makes my hair feel nice and smooth with a fresh minty smell. happy to know it's toxic free, but I'm not floored by it and would be interested in trying other non toxic conditioners. I started off my experience with Andalou and loved it so I tried this one that looks very similar and was disappointed. I still have to use up what I bought, but I won't buy again. It disappears in my hair instantly and I feel the need to use a tennis ball size glob, but I hold back. I use a trace amount of jojoba oil after to give it some moisture, but I wouldn't need to if the conditioner did its job. Next! Fantastic, high quality natural, organic conditioner; you barely have to use any to spread it around your hair and it leaves your hair feeling clean, thick, and hydrated. Awesome product. The smell is great and it leaves my hair clean and freash. Combine with the shampoo for a perfect clean and care. Smells great (very peppermint-y) and leaves my hair soft. Although it's not as hydrating as I'd hope (my hair tends to be on the dry side), I'd still recommend it. Really love the tingly peppermint! Hair feels so moisturized! I love the minty smell, so refreshing! It doesn't feel like typical chemical conditioners because it sinks in right away instead of feeling slippery. I use a wide tooth comb to make sure it's evenly distributed in my chin length hair, and then rinse after a minute or so. My hair feels very nourished. I don't know if this would work as well on someone with long or very dry hair, but it's certainly worth a try! Smells truly minty! Nice, light conditioner. Great product! Easy on hair. One thing I have started noticing is that my hair doesn't break that much anymore. 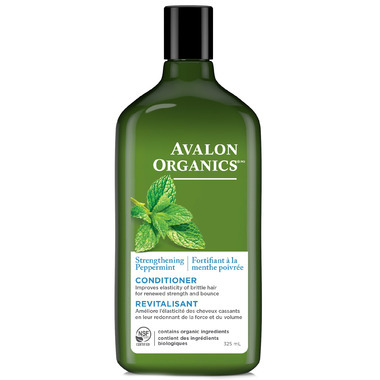 I've been using Avalon Organics shampoo and conditioner for about a year now and absolutely love what it does for my hair. Incredible product. Leaves your scalp feeling amazing!